Inside the University of Pittsburgh’s historic Cathedral of Learning, occupying the first and third floors, are a series of Nationality Rooms, designed to represent the cultures of various ethnic groups that settled in the Pittsburgh area. The rooms were built and supported by each respective cultural group in Pittsburgh with some support even coming from various national governments. The first 19 rooms, built in the 1930s and 40s were an important part of Pittsburgh’s immigrant history as events back home in old countries played out in local headlines. The events which prevented the German and Italian Rooms’ completion until after the war; the successful 1934 nationwide fund drive conducted in the United States by the Chinese Room Committee, when hostilities in Manchuria delayed the donation pledged by the Chinese government; the sadly prophetic words spoken by Jan Masaryk at the dedication of the Czechoslovak Room in 1939; and the haste to ship the Pentelic marble columns for the Greek Room before war closed the Mediterranean to American shipping routes in 1940— all lend to the significance of these rooms to the history of the city and the university. Between 1938 and 1957 each room was dedicated in an impressive ceremony. Archbishops, diplomats, choirs, University representatives, students and townspeople joined in celebrating the completion of these gifts to the University bestowed by proud, diligent communities. The Greek Room Committee was organized in 1930 by Nicholas G. Kalmer, a University of Pittsburgh graduate, who went to Greece to present the plans to Eleftherios Venizelos, then Premier of Greece, and George Papandreou, Minister of Education. Mr. Papandreou appointed a committee of outstanding archaeological authorities to oversee the room’s establishment and saw it as a matter of national importance to have Greece represented at one of the top public universities in the United States. The Ministry of Finance authorized ten thousand drachmas for the project. The focus originally was to be a Byzantine-inspired room. 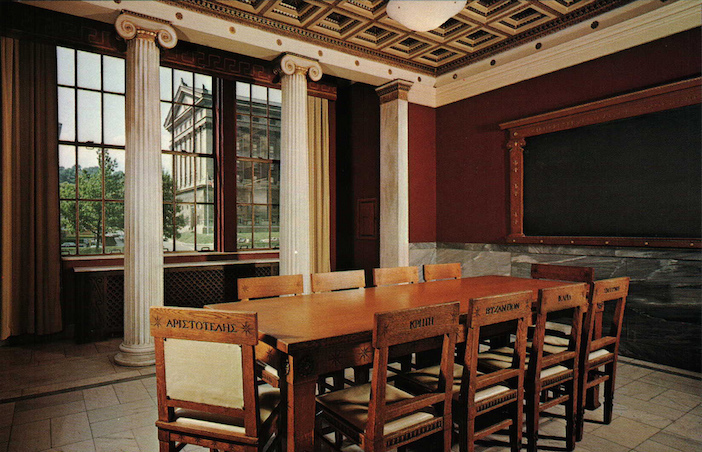 In the spring of 1932, Dr. George E. Mylonas, professor of art at Washington University in St. Louis, worked with the Athens committee to select John Travlos as the room’s architect. 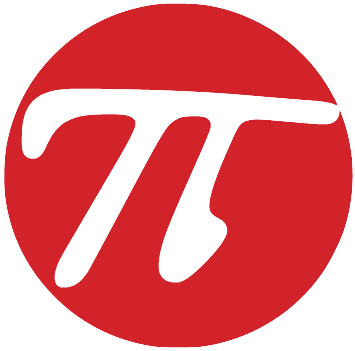 Travlos sent— by boat— a classical design to the committee in 1938 and the local committee unanimously accepted the new design. Although no written proceedings exist, locals who remember the meetings recall a bitter feud between the community organizers and local church officials, who insisted on the room maintaining its Byzantine design. Representing Fifth Century BC Athens, columns line the room made from marble that was mined from the same Greek mountain where the stone was quarried for the Parthenon. It was loaded on the last vessel to leave the Mediterranean before Italy invaded the region during World War II, according to the archives at the university. 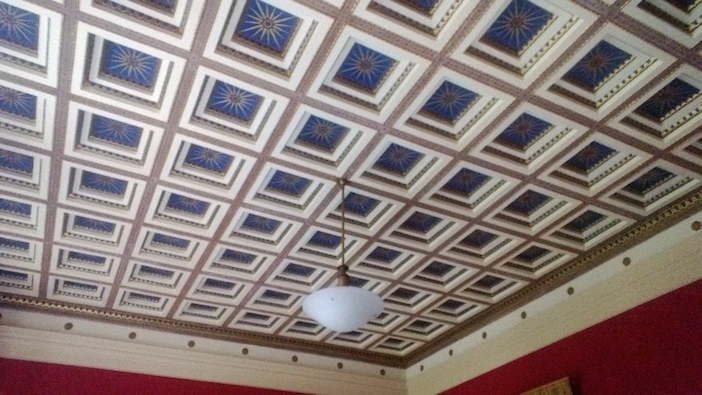 John Travlos continued to live in occupied Greece while the Greek Room was being built and didn’t know whether the marble would ever arrive in the United States. Then, while huddled under a blanket in a closet illegally listening to the BBC radio, Travlos discovered that the marble had indeed made it. 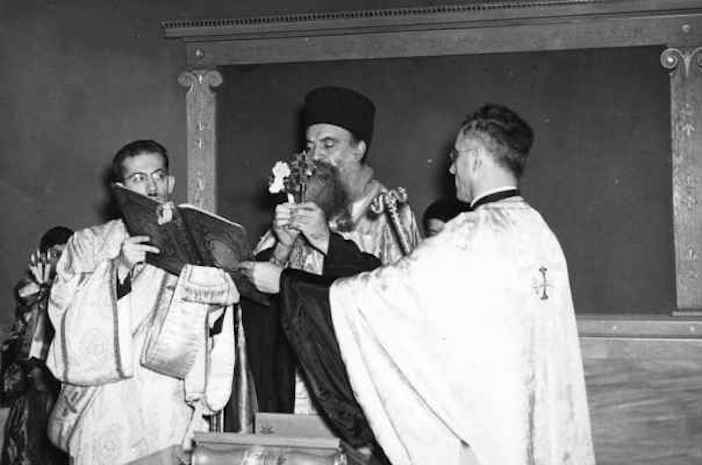 He heard Greek ecclesiastic music over the airwaves, then the proceedings of the dedication of the Greek Room in Pittsburgh, officiated by then Archbishop Athenagoras of America. The student chairs are etched with the names of towns and islands where many of the Greek American benefactors emigrated from— Crete, Ikaria, Smyrna (in Asia Minor)— even the tiny Peloponessian village of Vlahokerasia, where many of Pittsburgh’s Greeks came from. The classrooms are in full use by various departments of the university— often in use from morning until night, offering students a unique cultural opportunity while learning. Each room has its own distinct history and style. Thirty thousand people annually visit the rooms and take tours when classes are not in session. The Cathedral of Learning and the Nationality Rooms have been designated Pittsburgh Historic Landmarks.